Our Parish Mission Statement calls all of us “…to witness Christ’s continuing presence in the world.” One way we can do this is by giving the gift of our time to create a prayer environment that is spirit-filled. Think of all the gifts and graces and blessings we have received from God. We received the gift of life, family, friends, work, education, home, and all the conveniences of life. You are invited to pray about your call to ministry, to discern your gift or talent, and to test your giftedness by sharing it with your parish family. For more information on any of these ministries, please contact Deacon Peter Rooney at deaconpeter@ascensionofourlord.net or Vince Zaprzal at vzaprzal@ascensionofourlord.net. Those who care for the altar linens ensure that they are washed and ironed and that an ample supply is always available. Duties are performed on an as-needed basis at your convenience. Boys and girls in the 7th grade and up are encouraged to assist at the celebration of the Eucharist and other liturgical events throughout the year. High school students are encouraged to continue serving beyond Confirmation. Adults interested in serving are encouraged and will be trained on an as-needed basis. Ministers are needed for all weekend Masses. Commitment is for about 2 Sundays a month. Training is mandatory and on-going. This ministry reaches out to homebound and hospitalized parishioners and brings them Eucharist. As with Extraordinary Ministers of the Eucharist, training is mandatory. 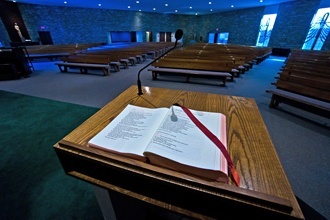 Those with an interest in public speaking and have a desire to proclaim scripture are encouraged to serve as a lector at Mass and other liturgical services. Frequent personal reading and a love and understanding of scripture are helpful. An understanding of the liturgy is also necessary. Training is on-going. Hospitable and friendly people are needed for this ministry. Responsibilities include greeting people at the door, seating people and directing the movements of the assembly as needed during liturgical services. Additionally, ushers take up the collection, choose individuals to present the gifts at the offertory and distribute bulletins at the end of Mass. Currently, gift bearers are recruited from the congregation by the ushers before Mass. In an effort to include the family as a unit in the liturgy, the parish encourages families to participate in this opportunity. The honor of being a gift bearer requires no special skill or permanent ministerial duty, yet, is a beautiful and significant part of the Mass performed by lay people. The Adult Choir is open to all adults beginning at high school age. It sings weekly at the 10 a.m. Mass on Sundays, plus on many Holy Days of Obligation. We welcome new singers and instrumentalists. Rehearsals are on Wednesdays from 7:00 to 8:30 p.m. in the church. The Contemporary Ensemble is open to all adults interested in singing familiar and newer contemporary liturgical music. We welcome singers and instrumentalist as well. The Contemporary Ensemble sings at one Mass (Saturday at 4:00 p.m.) each month. Practices are held at 3 p.m. before the 4 p.m. Mass. INSTRUMENTALISTS: Time commitment is based on individual availability. to become part of another community; to share your musical talents. For more information, contact Darlene Crilly at dcrilly@ascensionofourlord.net. These people assist in decorating the worship space at the change of the liturgical seasons and for specific feast days. The team may be asked to set up for holidays on the morning of the holiday, several times during Holy Week.